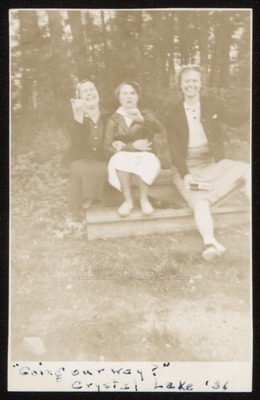 Three Westbrook Junior College students sit on a wooden platform in the woods at Crystal Lake in Maine, in this sepia toned candid snapshot labeled, on the front, with "'Going our way?' Crystal Lake '36." All have their thumbs poised in the air for hitch hiking. On the back of the photo is written in blue ink: Moore, Craig, Cunningham. Moore and Craig sit side-by-side with their arms linked. Cunningham sits a bit apart and closer to the camera. All three wear skirts and blouses with sweaters over their blouses. Flat, comfortable footwear and scarves on their heads complete their informal lake & woods attire.